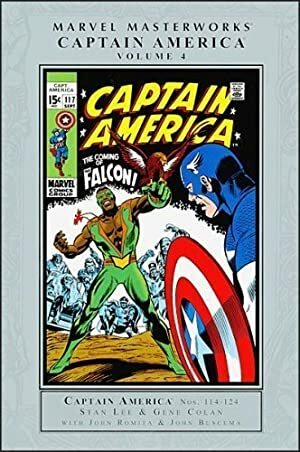 Ever since the 1960s, the Falcon (Sam Wilson) has been one of Captain America’s closest allies. 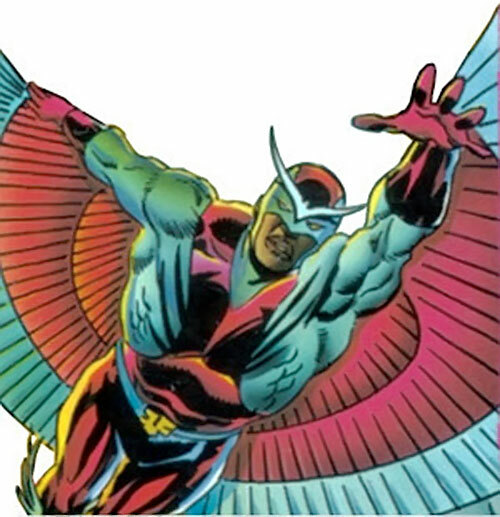 Though he has but a very minor super-power, he’s also a highly experienced adventurer and crimefighter, and usually operates artificial wings. Real Name: Samuel Thomas “Sam” Wilson. 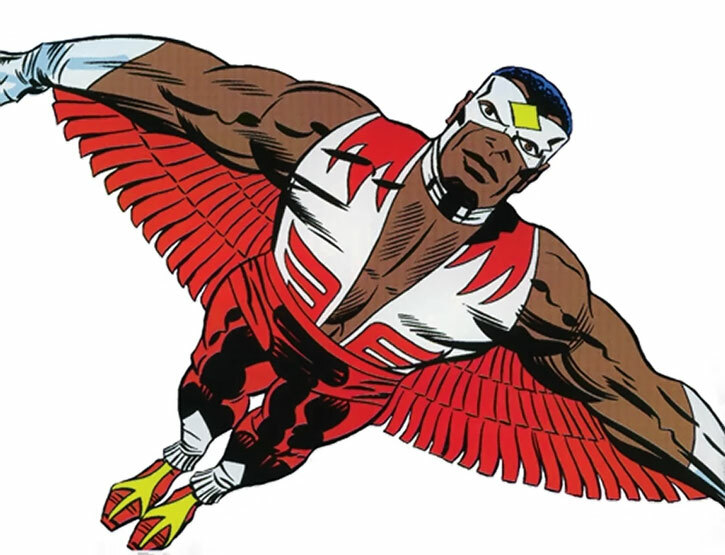 Other Aliases: Blackbird, Brother Falcon, Brother Super-Hero, Captain America, “Snap” Wilson, Willie Samuels. Group Affiliation: Frequent partner of Captain America; (Formerly) trainer of the SHIELD Super-Agents, The Avengers, Secret Avengers, Night People, Queen’s Vengeance and was a “Defender for a Day”. 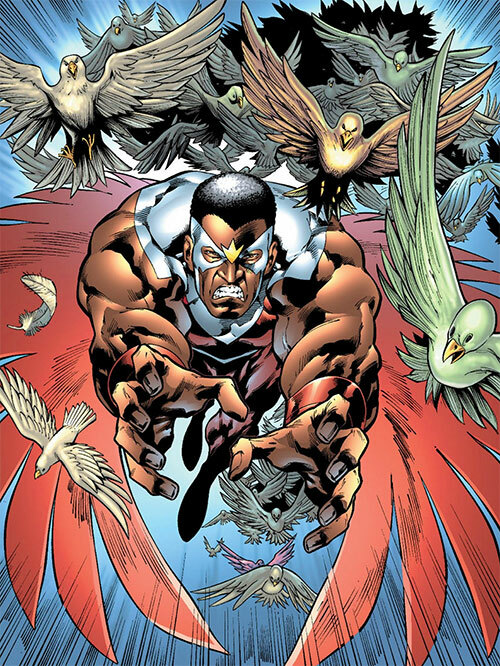 While he originally only possessed the ability to communicate with his pet falcon, Redwing, this ability has evolved to allow him to communicate telepathically with all birds. This link also allows him to see through the eyes of any bird in a large area. His link with Redwing provides him with some level of protection from psychic intrusion. Sam is also a highly accomplished athlete and combatant, having been trained by Captain America. His current costume, designed by the Black Panther, has a vibranium microweave, making it resistant to small arms fire. It has an emitter array on the back which can project solid light holographic wings, and a magnetic drive, which allow Sam to fly at speeds in excess of 250 mph. The wings, which can be created in a number of different configurations, up to a nearly 50 foot wingspan, can be turned on and off instantly. The suit also jams satellite tracking, and the holographic nature of his wings fouls up infra-red. The cybernetic controls also provide some shielding from psychic assault. 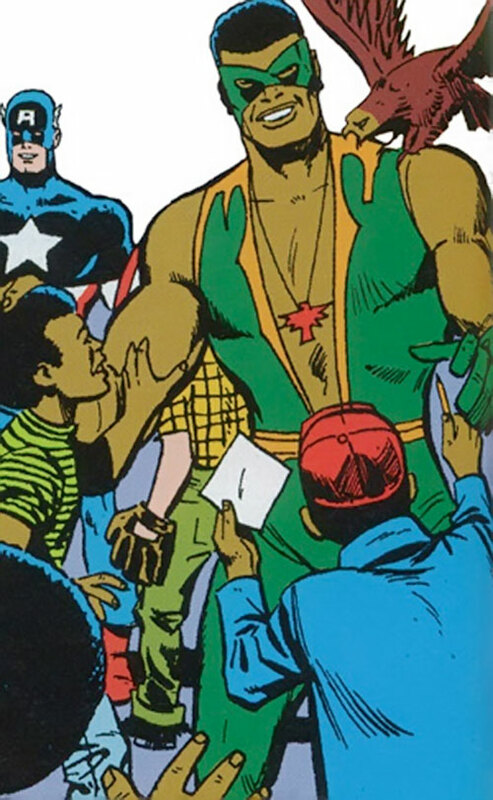 Sam Wilson is the son of a dedicated and influential minister in Harlem who died trying to stop a street fight. Sam idolized his father and tried to emulate his selfless humanitarianism after his death. But when his mother was killed by a mugger two years later, Sam’s grief and anger consumed him. 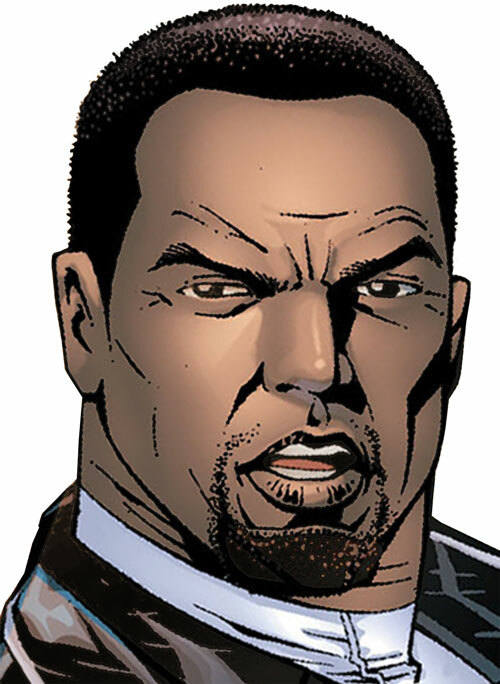 Severely depressed, Sam Wilson’s personality changed. No longer was he a concerned community volunteer, but a self-serving racketeer who called himself ’Snap‘. En route from a mob assignment in Rio de Janeiro, Wilson’s plane crashed on the Caribbean Island run by the Exiles, and band of professional killers who worked for the Red Skull. The Skull used the powers of the Cosmic Cube to transform “Snap” back into Sam, in order to use him as a pawn against Captain America, who was at that time trapped on the island. The Skull reasoned that Wilson’s former idealism would appeal to the Captain enough that he would train him as a partner. Then, at some later date, the Skull could use him against his enemy if his current attack failed. Wilson had always had a remarkable talent for handling birds, especially Redwing, a hunting falcon that he acquired in Rio. The Skull used the Cosmic Cube to strengthen their rapport into a permanent supernormal mental link, giving Wilson yet another qualification for being Captain America’s partner. 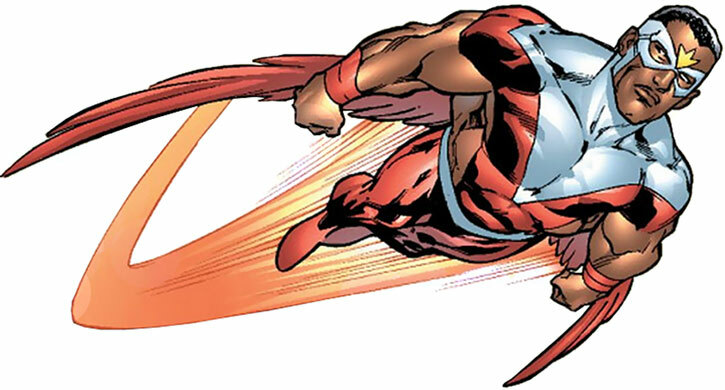 With the Captain’s assistance and training, Wilson defeated the Exiles and assumed the costumed identity of the Falcon. 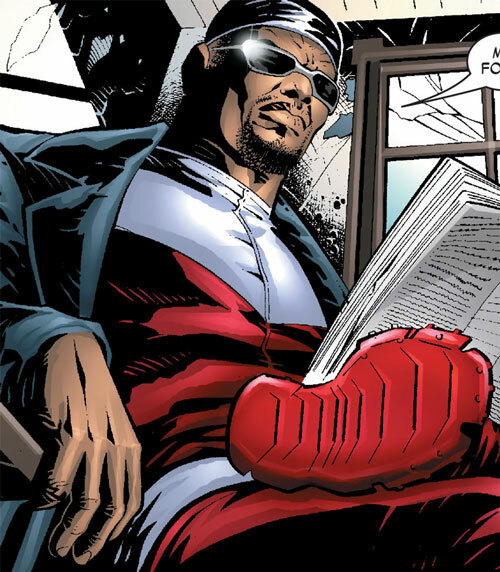 Returning to Harlem, Wilson’s ’Snap‘ identity remained submerged until some years later when he recalled his criminal past while undergoing shock therapy at SHIELD headquarters. Once his former criminal associates learned of this, a bounty was placed on his head. Wilson and Captain America fought off the attacks, however. The Falcon had been solely a rooftop swinging athlete, but grew unhappy with how he was viewed, being less feared by thugs than Cap was. 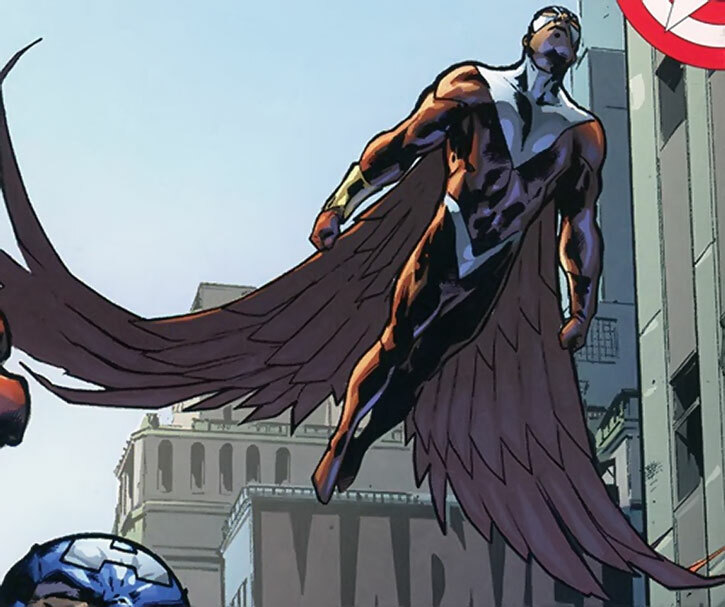 He convinced Steve to put him in contact with the Black Panther, king of the African nation of Wakanda, who used Wakandan technology to create a set of wings which enabled Sam to fly. 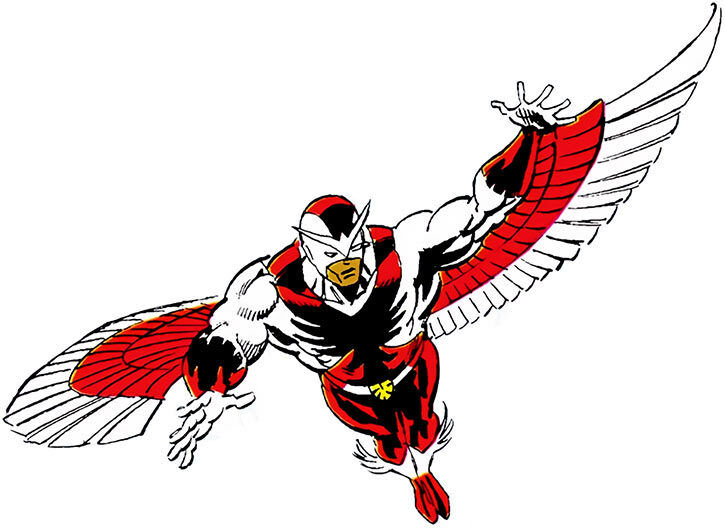 The Falcon became one of Harlem’s staunchest crime-fighters. He served, on and off, as Captain America’s partner for a long time, and the two men developed a deep friendship. When Steve was believed dead, Sam even took up the mantle of Captain America for a while. Sam was present when Nick Fury tried to get Cap to train the SHIELD Super-Agents. 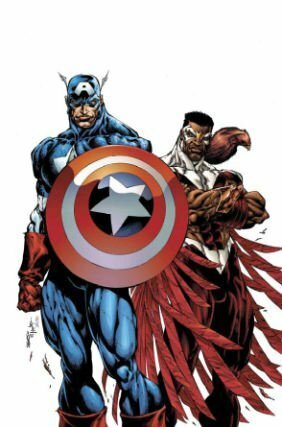 Cap refused, but suggested Falcon, who accepted the role. The team was made up of Marvel Man (who would later become Quasar), Texas Twister, Blue Streak and Vamp. The enterprise ended badly as Texas Twister quit, and Blue Streak and Vamp proved to be double agents working for the Corporation, who kidnapped Falcon. Captain America helped free him, but the project was ended, with Marvel Man continuing to work for SHIELD on his own. The government later put the Avengers under the control of Henry Peter Gyrich, to try and establish control over them. Gyrich cut back the numbers of the team, and demanded that Falcon be inducted as a member, due to ’Affirmative Action’ regulations. Sam was strongly resistant to this, but accepted as a favour to Steve, since otherwise the Avengers could well have been closed down. He felt uncomfortable in the group, especially having been forced upon them. He didn’t feel he had anything to offer them in combat either, which led him to take risks. He was happy to leave the team and return to patrolling his own neighbourhood, but remained a reserve Avenger, and came to there aid when he was needed. Wilson later ran for a Congressional seat only to be confronted again with his ignominious criminal history. Wilson almost relapsed into his “Snap” personality during this identity crisis before coming to terms with his past. 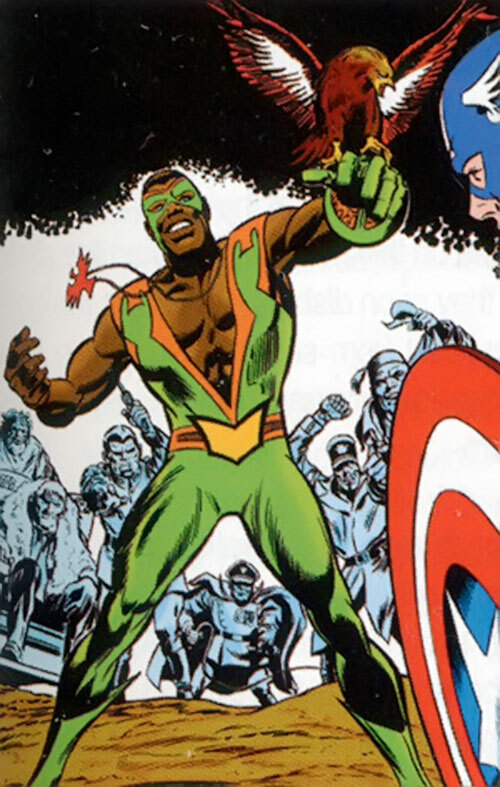 When Steve Rogers’ identity as Captain America was taken from him by the U.S. government, Wilson came to his aid, travelling the country with Rogers in his new guise as The Captain, along with Nomad, Demolition Man, and Nomad’s sidekick Vagabond. Sam kept trying to convince his friend to reclaim the name. He convinced him that he was responsible for making the identity what the American people saw it as being, and that he should be serving them, rather than the current administrators of the country. Steve eventually accepted his friends advice, and reclaimed the identity. Feeling that his flight harness was slightly outdated, he had a friend, Desmond Burrell, who worked at Stark, to create a more advanced version for him. Wilson helped the Avengers in their fight against the entity Onslaught and seemingly sacrificed himself to stop the menace. He was merely shunned to another dimension, however, and was later restored with the rest of the Avengers and their associates. He changed jobs from Social Worker to Urban Planner, feeling that he could do more for the community in this position. Sam later rejoined the Avengers, again at Steve’s urging, although he was more comfortable with his role at this point. The group now had international backing, but Gyrich had been assigned as their UN Liaison. 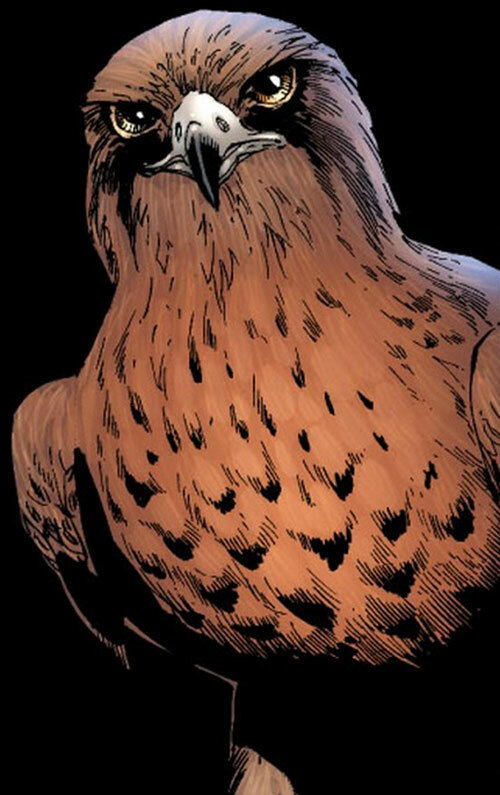 Falcon kept watch on him, and soon learned that he was being forced by US Government officials to spy on the Avengers. Sam confronted him, and Gyrich agreed to work with him against those who were trying to use him. They developed a mutual respect as they worked together, and eventually discovered Gyrich’s manipulation was part of a plot by the Red Skull to infiltrate the American Government. When Captain America was approached by navy intelligence to help in apprehending their rogue super-sailor, called the Anti-Cap (who wore a uniform identical to Cap’s), he was suspicious of the request. He recruited Sam to help him. Their investigation uncovered links between Navy Intelligence and the Riva crime family, and Sam had to break a reporter friend who had been investigating it, out of Guantanamo Bay, becoming labelled a traitor himself, because of it. Back in the United States Sam found himself a fugitive. At the same time, the Scarlet Witch was unravelling mentally, causing the Disassembly of the Avengers, and her powers caused his ’Snap‘ personality to reassert itself, without anyone initially noticing. When they captured the Anti-Cap, Snap began using him to serve his own agenda. 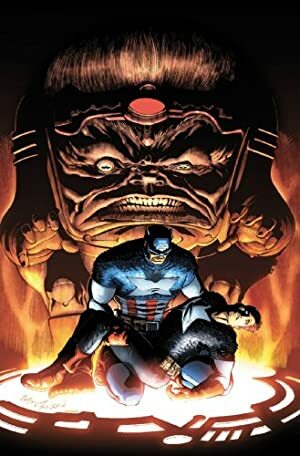 They brought down the Riva Cartel, which led to a battle with MODOK, who had been secretly controlling them, and then Falcon and the Anti-Cap disappeared. Captain America tracked the Anti-Cap down by following a series of terrorist strikes against those states he considered enemies of America. He found the Anti-Cap, who claimed, shortly before committing suicide, that the Falcon was dead. This was proved to be false, and Sam soon reappeared. When the government passed the Superhuman Registration Act, Sam was the first person recruited by Captain America when he began organising opposition to the Act. He became part of the Secret Avengers resistance force, where he basically functioned as second-in-command. It is unknown whether he accepted the general amnesty. Cool tempered and professional, the Falcon is an experienced and calculating fighter who rarely rushes into things unprepared. 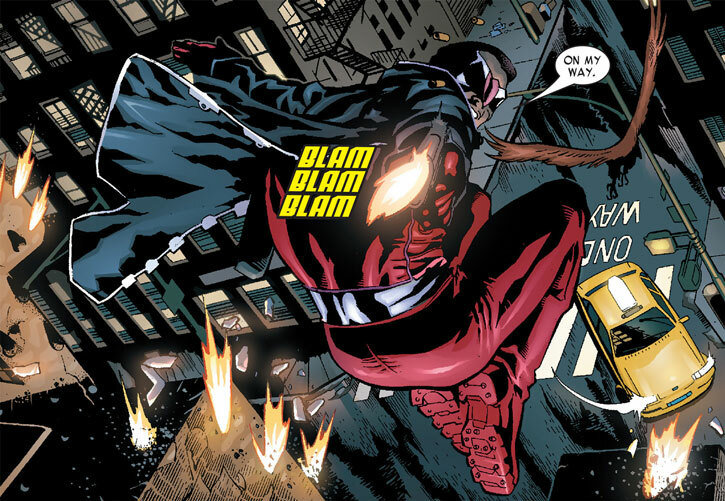 He is aware of his capabilities and limitations, and rarely rushes impulsively into danger unless lives are on the line. In combat he usually stays in the air, keeping his distance from opponents. Sam prefers to operate on a street level, feeling that he can have more of an impact on making ordinary people’s everyday lives better. He has a deep friendship with Captain America, but while he respects his friend, he does sometimes view his idealism as being slightly too naïve, so will sometimes hide his actions from Steve if he feels it necessary. In his ’Snap‘ personal, Sam is ruthlessly pragmatic, and will intimidate and brutalise anyone who gets in his way. 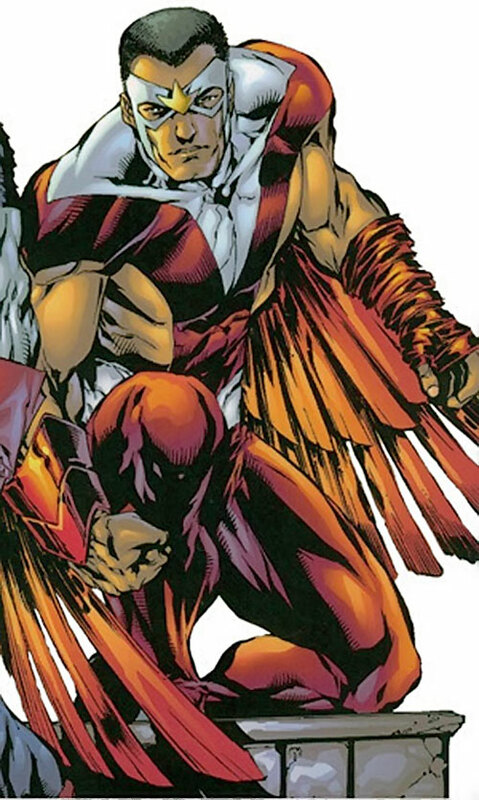 He was given a spare set of wings by Hawkman, and retained a strong friendship with the Hawks. 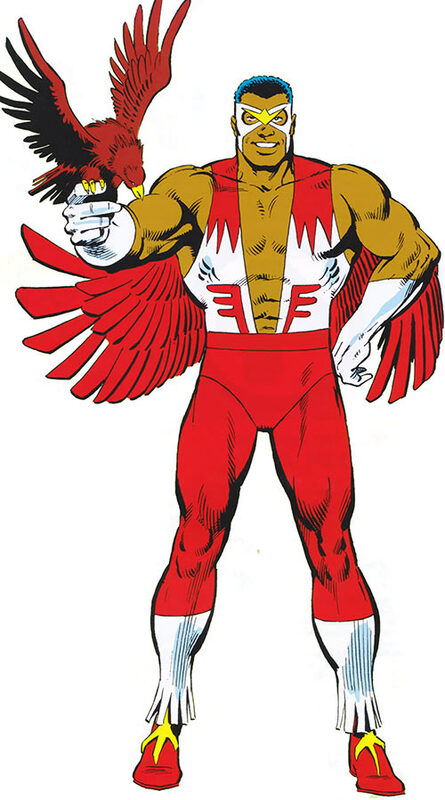 He could be used to replace the Hawks in some of their more convoluted JLA continuity. Eye of the Cat only works with birds (-1), and has the Area Effect Bonus at full Range (+9). Speak with Animals only works on birds (-1), is telepathic (+1), and can track an individual in the same manner as the Speak with Plants Power (+2). Area knowledge (Harlem, New York), Expertise (Social Work), Local hero (Harlem). Captain America (High), Avengers (Low), Black Panther (High), Street (Low), Henry Peter Gyrich (Low), Sgt. Tork, NYPD (High), Desmond Burrell (High), Texas Twister (Low). SUIT [BODY 05, Flight: 08, Kinetic Absorption: 02, Mind Field: 02, Obscure: 08, Bonuses & Limitations: Flight is winged (-1); Obscure only works on satellite surveillance and infra-red, and only works on infra-red when its wings in use (-1); Mind Field has the Field Protects Power User Only Limitation (-2)]. 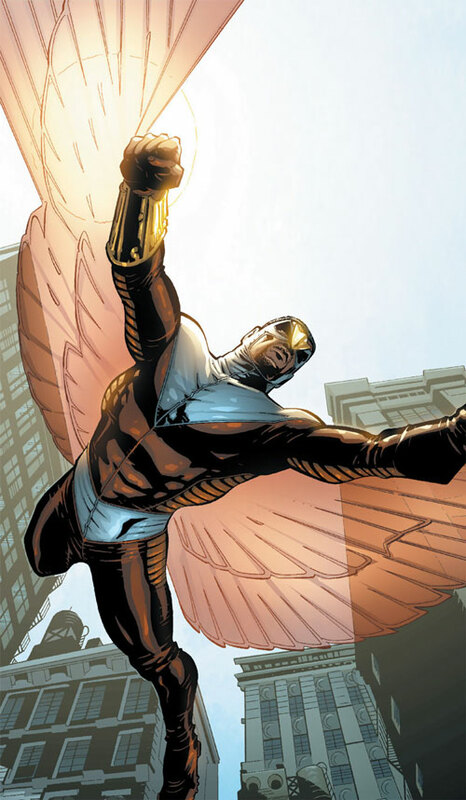 The Falcon didn’t initially have the Eye of the Cat Power, developing it around the time he had the FLIGHT SUIT (below), with the Limitation that he needed to be wearing the suit to access the Power. During his first time with the Avengers, he had Uncertainty, feeling out of his depth as part of the team. 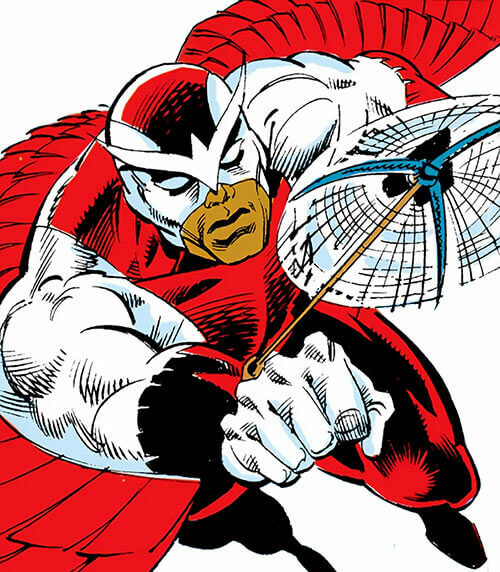 Prior to the (relatively) recent Captain America and the Falcon series, he had a Low-level Connection to SHIELD, which he may reacquire following the period of this write-up. 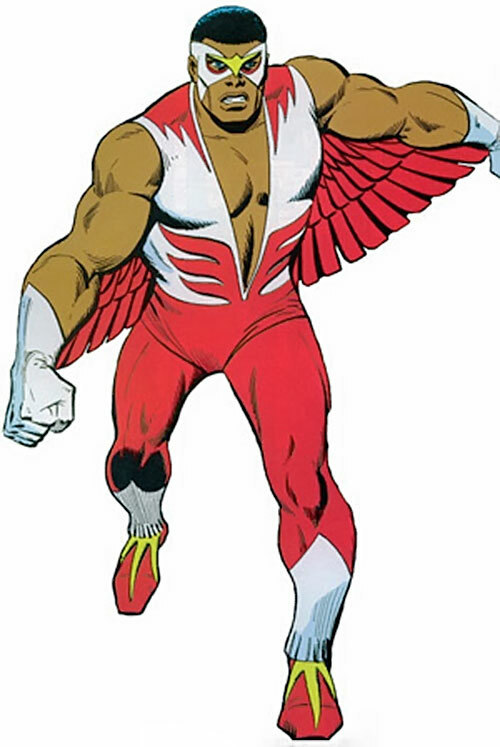 He also had a High-level Connection with Quasar, and would probably have it again if Wendell ever returns. COSTUME [BODY 04, Gliding: 02]. GRAPPLING HOOK & LINE [BODY 06, STR 04, Stretching: 02]. He later used a set of jet-powered glider wings built by the Black Panther, which he used for most of his career. The earliest version required him to launch himself from a height of at least a few metres. FLIGHT HARNESS [BODY 05, Flight: 07]. A stretch fabric over steel alloy mesh. Detachable jet-powered wings made of lightweight titanium ribbings and mylar, which he could control remotely. Wafer-thin solar receptors on the wings, powering high-speed electric turbine fans in the costume and boots. Cybernetically-controled ’talons’, grappling hooks which could also be used for entangling targets. A visor with infrared, telescopic vision and a screen within the visor that showed pictures from small cameras around the suit, allowing him 360° vision. FLIGHT SUIT [/BODY/ 05, Claws (Only Killing Damage, use Stretching as Range): 05, Full Vision: 04, Interface (control Wings only): 07, Radio Communications: 08, Shade (Visual and Audio, incl. audio hypnotic powers): 06, Snare (Creates Swing Lines, use Stretching as Range): 05, Stretching (Claws and Snare only, and has No Fine Manipulation): 03, Telescopic Vision: 07, Ultravision: 07] w/Wings [BODY 05, EV 07, Flight: 08]. 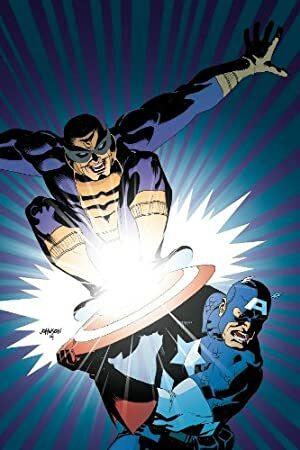 During the Heroes Reborn event he apparently had an emergency blood transfusion from Captain America, giving him some super-soldier ability on a par with Cap. This doesn’t appear to have carried through to his more recent appearances, and I’m not aware of any change that could have removed them. So if you want to use him around this period, you may want to consider raising his Physical Abilities and Skills to closer to those of Cap. He has been shown in an apparently more armoured version of his flight suit (which may or may not be an artistic interpretation of the FLIGHT SUIT in the Previous Stats section), but I don’t have enough information to be certain of its capabilities (although it did appear to have searchlights on the front). Accurate Attack, Agile Feint, Close Attack 4, Defensive Roll 2, Evasion, Improved Defense, Improved Trip, Move-by Action, Power Attack, Second chance (Will versus mental afflictions). Benefit (Local Hero: Harlem), Sidekick 7 (Redwing). 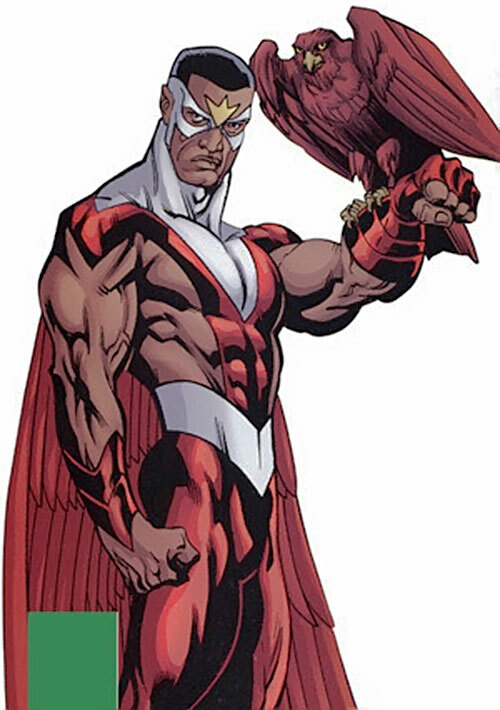 Upholds Good Falcon acts because he believes in right. Public Identity His real name and various aspects of his life are generally known. Trade-off areas Attack & Effect PL 7, Dodge/Toughness PL 10, Parry/Toughness PL 10, Fort & Will PL 10. Point total 190 Abilities 54, Defences 23, Skills 26, Powers 64, Devices 0, Advantages 22. Equiv. PL 13. Abilities 8, Powers 14, Advantages 1, Skills 4, Defense 4 — Total: 32 points. Source of Character: Marvel Comics (up to Civil War #7). Helper(s): Chris Cottingham (for the base bird stats), (History section adapted from Gamers Handbook of the Marvel Universe, and Marvel.com ), Roy Cowan, capita_senyera, Sébastien Andrivet, KalEl el Vigilante, Azrael, Eric Langendorff, Pufnstuff, Frank Murdock, Vincent Paul Bartilucci. M&M stats by Pawsplay.